One of Asia’s longest rivers, the mighty Mekong snakes its way some 3,000 miles from its source on the Tibetan plateau to its vast delta in the South China Sea, along the way providing irrigation, drinking water, food and a transport artery for millions of people. Riviera Travel’s 15-day ‘A Journey on the Mekong’ voyage through Cambodia and Vietnam is a fascinating way to experience all the colour of local life along the river. Water buffalo pull ploughs across emerald-green paddy fields, while locals in conical hats work the fields and excited kids run along the bank, waving at the boat. 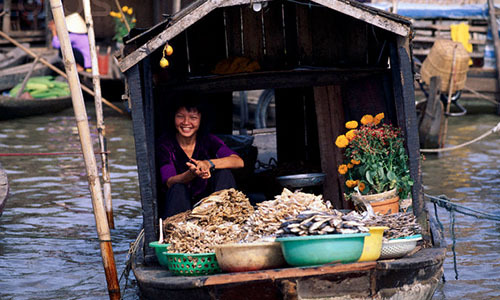 There are intricate temples, colonial towns, floating markets and 21st-century cities to explore. 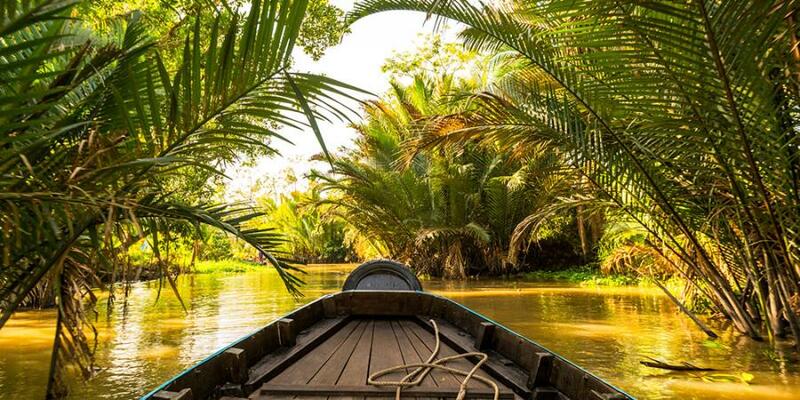 Here are ten tips to prepare you for your Mekong adventure. Not all river cruisers have a shallow enough draft to navigate the vast Tonle Sap Lake but both Riviera Travel’s boat, RV Mekong Adventurer is able, at certain times of year, to make the 160-mile journey from the dock near Siem Reap to where the Tonle Sap river, a tributary of the Mekong, flows out of the lake into the Cambodian countryside. This crossing is a real highlight. You’ll see floating fishing villages populated by Vietnamese who live entirely on the water, with shops, rudimentary schools and cafes all housed on rickety boats. The lake itself is fascinating, too; it’s so shallow you may sail past the tops of submerged trees, or see crocodiles lurking on the banks. If you cruise at the beginning of the season, in September or October, the weather will be hot and humid, with daily rain showers, although these tend to be short and sharp. 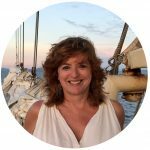 Why cruise now? 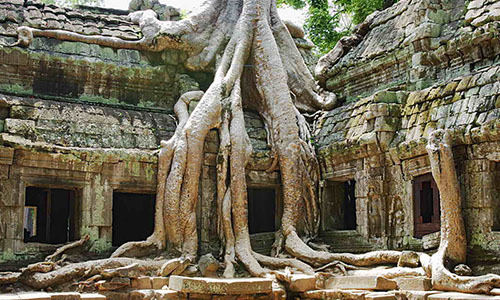 Because it’s also a magical time to visit, as the temples of Angkor are almost empty, rain splashing off the ancient stone, sinuous creepers, soggy with moss, twisting around 12th-century carvings. Seeing the place without the crowds is very special. Anything goes along the Mekong, so be prepared. You’ll zoom around Phnom Penh in a tuk tuk, and board a traditional longtail boat in Kampong Chhnang to get closer to the floating village on the Tonle River. Rustic oxcarts will bump you along to the monastery of Wat Kampong Leu and in Tân Châu, you’ll be ferried around town in a rickshaw. It’s all part of the fun of travel in southeast Asia. 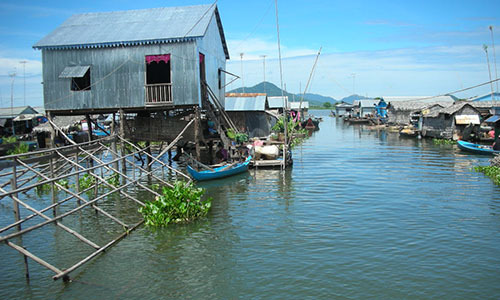 You’ll notice a marked contrast between the Cambodian and Vietnamese stretches of the Mekong. In Cambodia, the riverbanks are full of village life – women gossiping as they wash clothes in the river, children squealing as they jump off the muddy banks into the water. You’ll know when you’ve crossed into Vietnam as there’s a lot more bustle and industry. Floating markets operate from dawn to sunset and merchants paddle through riverside villages, hawking anything from sugar cane to pineapples and bonsai trees from their wooden boats. Noodle soup for breakfast may sound strange, but it’s a way of life in Cambodia and you’ll have a chance to try it on board your ship and in your Siem Reap hotel. Noodles, chopped spring onions, coriander, herbs, minced chilli and a big ladleful of shredded chicken are added to a broth, creating a nutritious, satisfying and not-too-filling start to the day. You can make the soup as spicy or salty as you like as every bowl is made to order. Try it; you might get hooked! And if not, there will be no shortage of eggs, pastries and delicious tropical fruit on the buffet. This may surprise you to know, but Vietnam is the world’s second-largest exporter of coffee, thanks to the bean’s introduction by French colonialists. Coffee, or ca phe, is big business in Vietnam today and you’ll see coffee shops all over Saigon, where coffee drinking is just as much a ritual as it is in, say, Italy. Cambodia has a thriving coffee culture, too; if you’re a connoisseur, head for the Little Red Fox Espresso on your free day in Siem Reap. The temple complex of Angkor Wat, near Siem Reap, where you spend a couple of days, is breathtakingly beautiful and mesmerising at any time of day. Make an early start for sunrise, as the temples are thrown into silhouette, reflecting in the glassy water of the reflecting pond, or take a prime position at sunset, when the whole façade glows golden, reflecting the setting sun. A lot of visitors have the same idea, so get there in good time. Your included excursion will include several temples, not just Angkor Wat itself, and each one is dazzling in its own way. There’s no real escaping the brutality of the Pol Pot regime in Cambodia and Riviera Travel’s visit to Phnom Penh includes a tour of the chilling Tuol Sleng Genocide Museum, or S-21 Prison, a former school that the Khmer Rouge used as a detention centre in the 1970s. Some 14,000 people were detained here and only seven survived, one of whom, the noble, 86-year-old Mr Chum Mey, still sells his book here and shares his experiences with visitors. There are fantastic night markets in Siem Reap and Phnom Penh, although you do have to sift through some tat to find real gems. 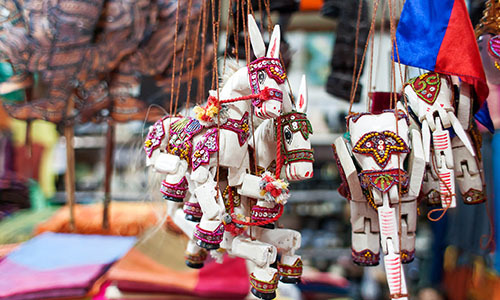 Look out for chequered scarves worn by the Khmer people, in cotton or silk; handmade candles, silver jewellery and woven mats; rice paper prints (the ones featuring images of some of the carvings on Angkor Wat are lovely); handwoven silks; and Buddha figures. In Vietnam, you can shop for packs of coffee, conical hats and the traditional (and very flattering) ao dai women’s costume of a long, wafty tunic worn over loose-fitting trousers. You’ll also find silks, lacquer boxes, embroidery, spices and even vintage propaganda posters from the war. Downtown Saigon, or Ho Chi Minh City, is a cluster of futuristic, glassy skyscrapers, a far cry from the grainy images you may remember from footage of the Vietnam War. On the ground, the city is a melée of bicycles, tuk tuks, motorbikes, pedestrians and taxis, flowing in a constant, noisy stream, 24 hours a day. Glass towers and futuristic malls aside, you’ll see thronging markets, street stalls selling sizzling noodles and steaming pho, the spicy Vietnamese soup, and serene Buddhist temples wafting incense. Just be careful crossing the road!